When U.S. Solicitor General Donald Verrilli made a vague case for regulating economic activity, Justice Ruth Bader Ginsburg needled him to get more specific about why it's necessary here and effectively made his case for him. When U.S. Solicitor General Donald Verrilli made a vague case for regulating economic activity, Justice Ruth Bader Ginsburg needled him to get more specific about why it’s necessary here — and effectively made his case for him. Ginsburg interjected again when Justice Antonin Scalia grilled Verrilli on whether government can require people to purchase cars if the insurance mandate is upheld. “I thought a major, major point of your argument was that the people who don’t participate in this market are making it much more expensive for the people who do,” she said. This Deadspin story about a Cornell pledge who dressed up as Mark Sanchez and signed autographs as part of a fraternity prank made its rounds through social media yesterday. This could have worked, but the fraternity chose the wrong time and location for the ruse. The New York Jets held their summer training camp at SUNY Cortland in the summers of 2009 and 2010, and a Mark Sanchez autograph signing would not have been out of place in Ithaca. Even though the Jets did not train in Cortland last summer, I imagine most students (or Ithaca residents) would have believed the Sanchez imposter if he said The Jets were back in town. There is also a problem with location. Let’s be real – Mark Sanchez is not going to sit outside CTB flanked by two 19-year-olds. Maybe he will sit in the Statler lobby. Maybe he will sit in the Cornell store. Maybe he will sit at a table on Ho Plaza. But, he’s not going to sit by himself in Collegetown in Ithaca, New York. This may have been more effective if he sat in the Ithaca mall food court or outside Walmart. Both are highly-trafficked places where people might actually believe a celebrity would sign autographs. When I was at Cornell, I thought it would be fun to do something like this with my fraternity. We would pick someone to dress up like a musician or comedian who was known to be in town and go to the mall. We’d plant brothers throughout the mall in groups to act excited when our faux celebrity walked by (with his entourage, of course) and to run up to him to take pictures and sign autographs. To really get into it, we’d have a camera crew following the celebrity equipped with a boom microphone operator and mobile lighting guy. I wanted to see if we could get unsuspecting mall visitors to believe the faux celebrity was actually someone famous. I never got a chance to do this. I still think it would be a fun prank and I hope someone tries it. I waited to be blessed." Apparently it is the first stanza of a larger piece entitled "Incident on a Campus." If anybody has the full text they can post, it would be greatly appreciated. Late last summer, Cornell announced a financial aid program whereby it would match any competing offer from the other Ivies, Duke, Stanford, and MIT. As MetaEzra commented at the time, it was essentially a ploy to land more hotly contested recruited athletes. Eighteen months later, we now know that roughly 1 in every 100 students in the Class of 2015 took advantage of the financial aid match program. As reported in a meeting of the University faculty, 12 non-athletes, and slightly more than 30 recruited athletes are benefiting from this quasi-merit based financial aid scheme. And anecdotal reports from various varsity coaches indicate that the money has been integral to cementing strong recruiting classes. 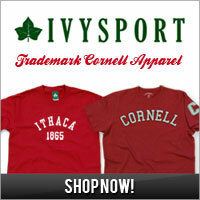 Of course, that doesn't mean that only 40 some-odd Cornell students chose Cornell over other Ivies. There are certainly some students that did not receive financial aid that were accepted at those schools as well. And then there are those students who, for whatever reason, may not have taken advantage of the program. Although perhaps their candidacy to Cornell should be reconsidered based on that fact. It’s a classic problem for businesses in small communities: how does the business compete with firms in larger markets to recruit top talent? If I were a professor, why would I move to Ithaca when I could secure a job at a university in or near a major city? One of Cornell’s chief priorities leading up to the sesquicentennial is faculty recruitment. A university is only as strong as its teachers, but while Cornell has a reputation for research, its location is a major deterrent in attracting preeminent professors. Further compounding the problem is the fact that professors’ spouses often need Ithaca employment and there are few, if any, major corporations in Ithaca outside of education. In fact, Dean of the University Faculty William Fry has gone on the record as saying prospective faculty members will only accept positions if their partners can find an appropriate job nearby. 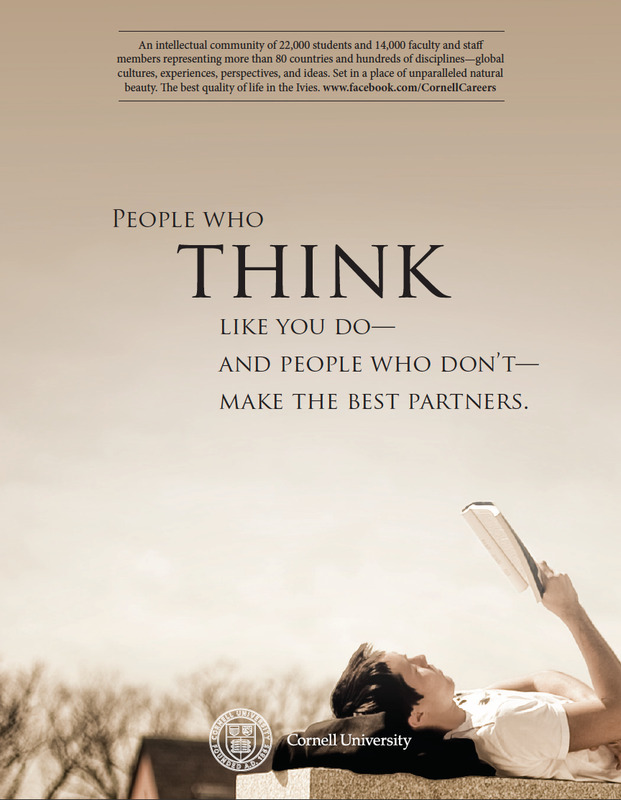 Non-academic spouses may view an Ithaca move as a step back or a pause in their own career goals. Cornell recognizes this challenge to their recruitment efforts and have, according to a recent article in the Daily Sun, begun to prioritize spousal employment. Under the Dual Career Program, the University works within its own departments and with Ithaca businesses to find rewarding careers for the so-called trailing spouses. Ithaca businesses benefit from the influx of talent, but the truth is that there are not enough jobs for all the potential spouses seeking employment as part of the faculty renewal initiative. As we get closer to 2015, it will be interesting to see the role the issue of trailing spouses has played in meeting recruitment targets. Strikingly, though, these requirements focus on broad subject areas and, therefore, content, a decidedly last-century approach. If there is one thing most educators and futurists agree on, it is that the new economy will be based on skills rather than factual knowledge. DiFrancesco's ideas reflect one of the contemporary critiques of the American education system. Some observers argue that we are wasting too much time teaching students basic facts instead of building critical thinking and analysis skills. Certainly, in this era of Google, it doesn't make a lot of sense to spend hours teaching students information that they could look up in a matter of seconds. Readers will think back to their childhood days of memorizing significant dates, quotations, or even equations. One could argue that none of these facts need be committed to memory in today's information age. The battlegrounds for new ideas in education tend to be underperforming urban schools, including the one at which I teach. In our effort to raise test scores, we place an extreme, school-wide emphasis on developing higher-order thinking skills such as analysis, critique, interpretation, prediction, and design. In fact, teachers are permitted to use no more than 90 minutes of class time each week to present new material. Over the last three days of the week, students and teachers ignore the basic facts and spend time developing higher-level skills. Such an approach is aligned with what DiFrancesco desires for Cornell. In his view, instead of wasting time learning about "sprawling" areas of academia, we should train students to look at data or other already-produced information and make sense of it. The problem, though, is that the higher-level mental connections that make DiFrancesco and others salivate are not possible without a solid foundation of lower-level information. My AP World History students have trouble naming two facts about Alexander the Great. But, if I present them with a list of information about Alexander, they can write a paragraph evaluating his greatness, or comparing him to someone they know, or critiquing his achievements. The danger is that I could present my students with a list of lies about Alexander ("invented the DVD") and they would probably believe them and go ahead writing their analysis paragraphs about how we should thank Alexander every time we watch Netflix. As one commenter on the Sun website pointed out, in this age of misinformation, students must be equipped with enough solid factual knowledge to identify falsehoods. There is also the obvious horror that students will have taken a whole year of AP World History without learning two facts about Alexander. I credit my Cornell education with helping me to make sense of the world around me. I do not rely on analysis skills exclusively, but rather a nuanced understanding of the past and present of people, institutions, and ideas. Perhaps it is not necessary for me to have memorized precise statistics about the incarceration rate, or specific details about laws dealing with weapons or drugs. But knowing this information helps me understand the challenges facing my students and their families in a way that searching on Wikipedia for the same information could not. There is a middle ground in this debate, in which teachers (as too many do) are no longer assigning students useless low-level book work, but experts and administrators recognize that a certain amount of lower-level knowledge is necessary to enable students to make higher-level connections. Cornell professors do not live in a bubble, and I have faith that they understand the kinds of skills that will best prepare students for success in the future. Skills and factual knowledge are wonderfully intertwined; together, they make up an education that would make Ezra proud. We all know this and we all say it. But, we don’t really feel it until we leave our alma mater. When in Ithaca, everything in Ithaca is of utmost importance. IFC decisions were endlessly critiqued and debated. The Student Assembly Finance Committee’s rulings on funding – or non-funding – of student groups were protested at Student Assembly meetings. The pressure of overcommitted calendars and upcoming deadlines were all-consuming, and anything outside of the small box of work and more work felt as though it didn’t matter. And, to many of us, nothing else did really matter. 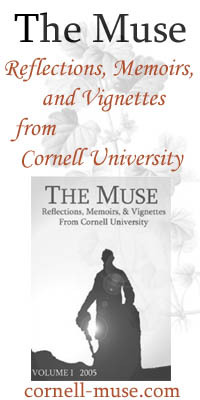 Cornell and the greater Ithaca were at the center of our world. Rather, they were our world. I realized this morning, while reading the Cornell Daily Sun looking for a topic on which to write, how I’ve escaped the bubble that is life on the Hill. Now that I’m eight months out, I no longer have much of an opinion on many of the day-to-day issues that seemed of paramount importance to us as students. As a case in point, among the headlines over the past two days are Collegetown drinking (surprise? ), liquor license difficulties at the Willard Straight Pub (it’s being named The Bear’s Den? ), GreenStar Grocery’s plans to open a Collegetown location (it sells organic food! ), and the increase in Rush Week attendance (reassuring for the Greek community’s viability given the recent changes in Rush Week). To be complete, there were some general news stories that could be found in any community newspaper, like a sledding accident on Libe Slope (I hope the student will be okay), Senator Mark Kirk ‘81’s stroke recovery (he will be okay), and the death of Professor Richard Leed ’58 (unfortunately he won’t be okay). To students, it’s the articles in that first bucket that would likely be the most important and discussed over lunch. Now, I’m much more interested in what’s happening on the national political stage than the latest issues in the non-existent microcosm of my New York City neighborhood. Although as alumni we are far removed from the bubble, there are still important and just plain interesting Cornell issues to think about from a different perspective. I may not have an opinion on this year’s rush week, but I still care about the direction of the Greek system. And, while it doesn’t matter that a new grocery store is opening, I do not want to see the general vibe of Collegetown change. I imagine many alumni feel the same way. After all, you are reading this blog. In celebration Ezra Cornell's 205th birthday, today is Founder’s Day. 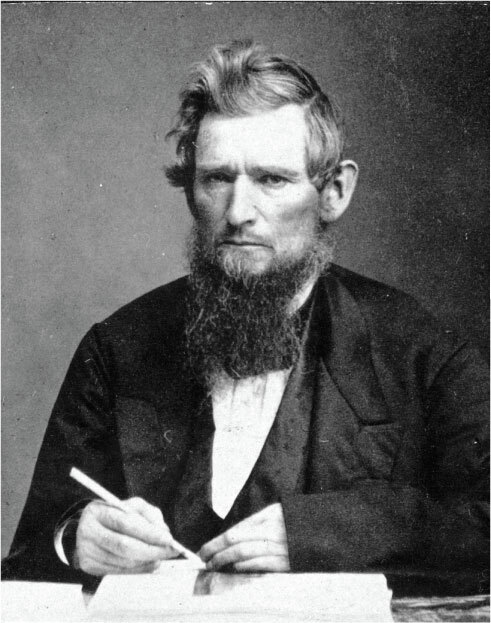 Ezra Cornell founded the university using his own background as a model for the type of education his school would provide. A carpenter, mechanic, farmer, salesman, inventor, entrepreneur, politician, trustee, and philanthropist, as well as a Quaker who left his religion to marry a Methodist, Ezra Cornell is a perfect embodiment of “Any Person…Any Study.” Of course, that is his own motto. Now, in 2012, with the sesquicentennial right around the corner, Ezra would have likely added “Any Place” to his idea of a Cornell education. This would have been preposterous in his time. However, today, not only is there a Cooperative Extension program in each New York State county, but also there is a Cornell footprint in New York City, Washington, DC, Puerto Rico, Rome, and Doha, Qatar. That New York City footprint is about to get even larger with the upcoming construction of the New York City Tech Campus. If you follow us on Facebook, you’ve probably already seen the RSS feed post announcing the imminent retirement of psychology professor Dr. James Maas. If you haven’t, here’s the news: Dr. James Maas is leaving Cornell as of the end of this year. Readers of this blog undoubtedly know who I’m talking about. In his 48 years as a member of the Cornell faculty, Dr. Maas has taught Psych 101 (which changed to 1101 in 2008) to over 65,000 Cornellians. This is not only a Cornell teaching record, but is also a world teaching record. In recent years, at least, Dr. Maas’ class has enrolled over 1,200 students each fall semester. He has won the Arts College Clark Award for Distinguished Teaching and the American Psychological Association's Distinguished Educator Award. 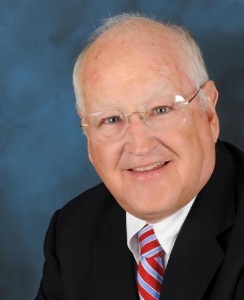 Outside the classroom, Dr. Maas is a world-renowned sleep psychologist and bestselling author. He is credited with coining the term “power nap” and has devoted his career to discovering the benefits of sleep as well as raising awareness of the importance of sleep to success in our waking lives. According to Dr. Maas, energy, mood, focus, longevity, and, correspondingly, our ability to perform, are all influenced heavily by the quantity and quality of our daily sleep. He regularly appears on national talk shows as a sleep advocate. What do you remember about Dr. Maas? His tenure spans 48 years of Cornellians and is likely one of the only professors who taught across so many class years. Share your memories below as a comment. Cornell is being particularly coy about today’s anticipated announcement from New York City Mayor Michael Bloomberg about the proposed New York City tech campus. Although the news broke late last night in the Wall Street Journal, the University’s Press Office is saying only to tune in to CornellCast at 2:30pm today for a “live event of special interest” to Cornellians. If you can break away at 2:30, watch the video here or through the Alumni Association Facebook page . Oh, and thank you to the anonymous donor for making this possible. -- Dale Corson, dead at the age of 97. -- The Big Red Pep Band is a class act. -- IvyGate takes down Dartblog harder than a de Swardt check. Hopefully MetaEzra will never receive (or deserve) the same treatment. -- Big Foote to be the next Jeremy Lin? -- The financial shake-up in dairy farming and how dairy farm camp paid one Cornell student's tuition. -- Why is Matt Yglesias in Ithaca?